That’s the feeling I had this past Tuesday when I recieved my multi-engine rating. I’d almost forgotten how nice it was. I’ve done most of my training at Sunrise Aviation at SNA. In fact, all my training except for glider and sea plane ratings. As much as I love Sunrise, I selected ATP, Inc. this time because they operate one of the world’s largest fleets of light piston twins. Sunrise has but a single multi-engine aircraft, and in my experience it spends a lot of time in the shop undergoing 100 hours inspections, repairs, annuals, etc. 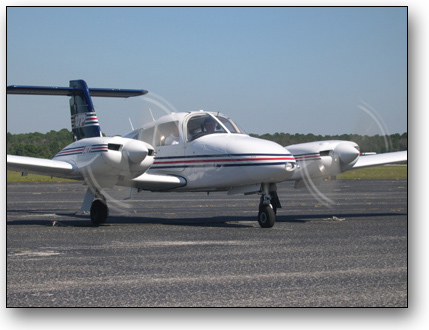 The ATP advantage is that if your aircraft needs to be taken off the line, they’ll have another one available for you within a day. And all their Seminoles are equipped with full Garmin panels, HSIs, dual transponders, and other goodies. I also liked the intensive scheduling that ATP uses. The multi-engine course takes only four days from start to finish. Of course, you do nothing else for those four days. But you get in, get out, and can get on with your life. Training with ATP also had me flying out of a different airport — in this case, Long Beach — which was great because it required me to deal with unfamiliar taxiways, new local procedures, and other things I’ll encounter as a professional pilot. It moves me out of the comfort zone and adds to the challenge. Many people who enter flight training want it to be as easy as possible. I feel those who take this attitude are shortchanging themselves. If you want to be successful as an aviator, you have to train for the day when you’re in IMC with an engine out, a sick passenger on board, the landing gear won’t come down, and the avionics are all scrambled up. Speaking of which, I had the advantage of flying for ten hours behind the Garmin GNS430. Though I practiced with the Garmin simulator before starting the multi-engine course, it’s just not the same as using it in the actual airplane. Since I wanted instrument privileges on my multi-engine ticket, I had to demonstrate an engine-out instrument approach on the checkride. I could have done this without using the approach overlay capability of the 430, but I wanted to really get familiar with how the unit worked and I’m proud to say I was able to roll with the punches on the checkride when we were switched from the VOR to ILS approach without much notice. ATP is big on procedures and checklists. You fly pitch attitudes, airspeeds, or other numbers. It’s always numbers. They operate this way because they primarily train people for advancement to the airlines, where every possible contingency has a company policy and a checklist attached to it. This way of thinking took some getting used to. For example, my Skylane checklist is two pages long. The ATP Seminole checklist is 32 pages long. And a lot of it needs to be memorized, in addition to the V speeds, mandatory callouts, and maneuver checklists. But it’s great preparation for moving up to larger equipment. Turbines, jets, and aircraft with more complicated systems to master. My CFI was excellent. Not only knowledgeable, but she made herself available for questions at off-hours and was willing to work around my schedule and needs. During the second day, for example, I was getting frustrated with my inability to make short field landings at Fullerton. She was smart enough to suggest we call it a day and resume the next morning. She was also in tune to the toll taken by the environment. Flying a Seminole in the middle of July is no picnic. You’re under pressure to perform well while the cockpit is over a hundred degrees and the sun is shining directly on you. The ATP facility at Long Beach is staffed by a single instructor, and I was her only student, so I basically had a monopoly on her time and attention. It was very nice. I think the only area where I might have had an advantage over my CFI would be in terms of piston engine management. Leaning procedures, oversquare myths, etc. This is due to my background as an aircraft owner and person who pays the bills; I don’t want fouled plugs, needless fuel burn, or premature overhauls. When you’re flying a company airplane on the company dime, it’s easier to just fly the plane the way they want. This isn’t meant as a criticism, just one of the real world differences I noticed as an aircraft owner. I think the next big step for me will be the CFI ratings. Again, ATP looks like the most appealing program from a time and cost perspective. I wouldn’t even consider them if I thought the training was in any way substandard, especially with somthing as important as an instructor rating. But the multi-engine course assuaged my concerns in that respect. 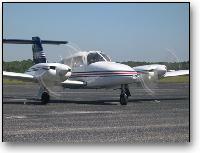 If you’re looking for quality multi-engine flight training, I can recommend ATP without reservation. Congratulations, Ron! Maybe one of these days I’ll get me a Garmin Seminole with dual HSIs, an IMC transcalligrapher, and a VOR overlay with auto-checklist. Yup. Okay… is it me, or is there some kind of double-entendre working here? I think the only area where I might have had an advantage over my CFI would be in terms of piston engine management. Leaning procedures, oversquare myths, etc. Not to mention “fouled plugs, needless fuel burn, or premature overhauls”! Your point would be well taken, but I can prove I fly airplanes: just look at my bank account balance! Ok, wait, I didn’t read into this post as much as Jason did! I meant, “You’ve always said”…! I was wrong. The sexiest thing is you!